Death by Darjeeling is the first novel in the "Tea Shop Mysteries" series by Laura Childs. I first attempted this series years ago shortly after its release, but ditched it in favor of Cleo Coyle's "Coffeehouse" mystery series. I guess since I was a huge coffee-drinker back then, it made more sense to put off Childs' series, but now that I no longer drink coffee, I thought I'd go back to giving the "Tea Shop" series a try. I chose to read Death by Darjeeling this month because it qualifies for the Monthly Keyword Reading Challenge over at Bookmark To Blog. "Death" is one of May's keywords. Theodosia Browning is the owner of the quaint and classy Indigo Tea Shop in Charleston, South Carolina. When Theodosia's shop caters an event hosted by the Charleston Heritage Society, a guest is found dead -- poisoned by tea. With no concrete evidence pointing toward anyone in particular, Theo falls under close scrutiny by local law enforcement and is considered a possible suspect. Theo then takes it upon herself to do some sleuthing of her own so she can save her reputation and figure out who truly murdered the party guest. It took me awhile to get through this novel -- I just wasn't loving it for some reason, and I'm still trying to put a finger on why it wasn't my "cup of tea." The Southern setting is prevalent in the cozy mystery genre, but this one was dull and lacked excitement. The imagery and setting descriptions were excellent and spot-on, but I just couldn't get into the characters. However, I fully understand that this was the author's debut, so of course I'll give the series another chance. I've actually got book #2 on deck and ready to go. 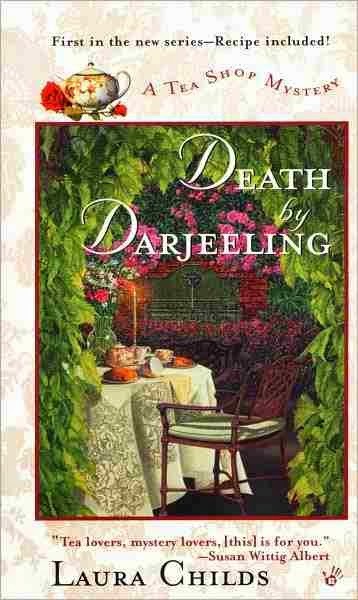 I also felt Death by Darjeeling lacked in comic relief, which made it fall short in comparison to other series in the Southern cozy mystery genre. The serious tone was a bit too over-the-top, and my overall response to this book was neutral. But again, I'll hang in there and read a few more in this series before I give up on it entirely.